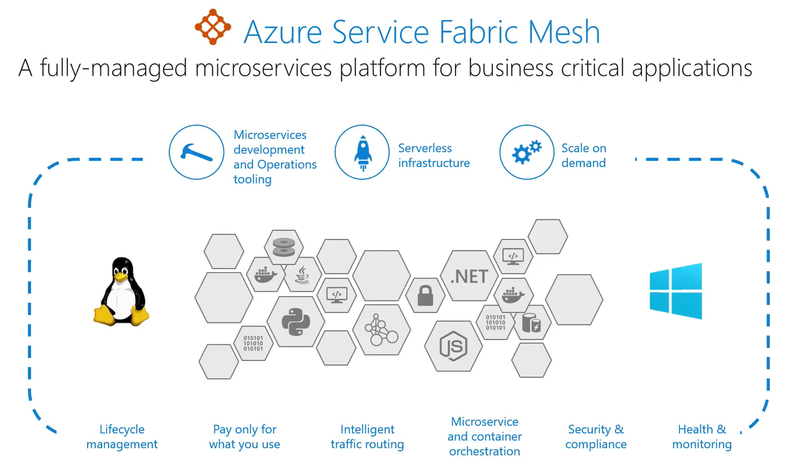 Service Fabric now has a relative in the cloud – Azure Service Fabric Mesh, a fully-managed service in Azure that will enable developers to deploy and operate containerised applications. This service is now publicly in preview after its initial private preview debut during Build 2018 last May. The Azure Service Fabric Mesh is a platform service in Azure managed by Microsoft, which allows developers to host their microservices or cloud-native applications packaged in containers. With Service Mesh Fabric Microsoft takes care of the infrastructure scale-up and scale-out needs of these services and applications. At Build 2018 Microsoft demonstrated Azure Service Fabric Mesh for the first time, and now has made it publicly available in order to received feedback from users of this service. With this release, Microsoft also made Service Fabric Mesh tools available for download in Visual Studio 2017. Moreover, with these tools, developers can describe Service Fabric applications by using YAML – a human-friendly data serialisation standard for all programming languages. The Service Fabric Mesh allows me to focus on my application and not the cluster. Furthermore, unlike the on-premise Azure Service Fabric, Azure Service Fabric Mesh takes care of various management details, such as container orchestration, routing, lifecycle management, compliance, security and monitoring according to Chacko Daniel, a principal program manager for Azure Service Fabric, in a channel 9 Azure Friday video. During the presentation in the video, Daniel mentions that during the preview period, users can only run a maximum of five applications, and the largest container is limited to four CPU cores, and 16-GB RAM. Developers can start with the new Visual Studio Tools for Service Fabric Mesh, build or choose one of the applications they want to lift-and-shift to the cloud, package them into a container – either Windows or Linux, and subsequently deploy by using the Azure CLI with an application manifest to the Service Fabric Mesh service. The manifest file contains the specification of the set of services in the application along with any scale and networking requirements. This service not only allows me to run Service Fabric applications which are stateful, but you can also run any container workload on it. Furthermore, Service Fabric Mesh has other capabilities like elastic scaling, easy deployment, container support, and built-in support for Envoy – an open-source edge and service proxy enabling developers to use routing rules for flexible traffic routing. Although many enterprises want to move to serverless platforms as soon as they can, they struggle with understanding, implementing and managing these complex infrastructures. The announcement of Azure Service Fabric Mesh is a key step ingredient for CXOs that want to build next-generation applications on serverless infrastructure. We’ll have to check on the platform’s adoption in a few quarters from now. Today the Azure Service Fabric Mesh is available in three Azure regions - US West, US East, and Europe West - and Microsoft expects to expand to other Azure regions in the coming months. Furthermore, more details documentation are available at the Service Fabric Mesh documentation page.